Ah! can I hear the scented rain intone? Of busy folk that hurry darkly by? Shine on me, and a happy maiden cries! Since I clasp’d her, ’neath the leaves, that summer day? And were there words of parting, words of woe? Sits she among her children far away? Can she hear the sweet and melancholy sound? Doth she see the shining dewdrops on the ground? Yet, love, the city fadeth with its pain! The old bright dream is drowsy on my brain! ‘The Bachelor Dreams’ was published in The Argosy (No. 6, May 1866). And I thank thee for giving that death-thrust sure. Was a knightly death by the hand of a knight. A priest—no, by heaven! your hand, D’Avanne. We’re friends, I trust? you forgive the lie? Injure you, slander you, faith not I! I questioned her purity—only to die. And I’ve proved she is pure with my blood, that’s all. But the slander of one’s own eyes is the worst. De Loye, you knew her? my wife that is dead? Nay, man, never tremble and hang your head! Chew’d the cud, too, as cattle eat succulent clover. I who am going to join her up there! Your hands, but come closer—and listen to me. The mortal scum of a monarch’s pleasure? And rose in my own opinion too. I was ever the same—an ill-favoured fellow! Base-born, moreover, of no degree! God bless her, therefore, for smiling on me. How they stared! Just as you, De Loye, stare now! Even King Francis made a grimace! Snug enough in a town where few go. How firm I felt on my legs! how glad! With the beaded brilliance of bright champagne! I was never a man to waste money or miss time. Such a life! a summer dream of joy! Who caught but a glimpse of her beauty and fled. Ride over the mountains and fight in Spain! Sparkled dark on a bosom too stony to grieve. Women are nobler than men believe. To return to the business of wounding and killing? I had feared any change, yet was pleased when it came. That women should love us so utterly? Till these cheeks of mine were as brown as lizards. Where the senses lighted like butterflies. And I liked him—because he had eyes like hers. And saved my life three times, as I said. At home at the Castle. I galloped on. And a bliss like quicksilver sparkled through me! And, drawing his sword, with that grace of his, knighted me. To Marie, in the pride of my honour new-gained! Into the room where my lady slept. Like the gleam of a lamp on a face that is dead. There’s a hammering, clamouring, here in my head! His bright eyes sparkling, Angelo. As we tomb’d him in silence, and left him to die? Black account with the woman, my mistress. But no! I kept my secret,—till now (I die! And . . . Marie!—Marie! Buchanan also wrote a letter to The Athenæum on 10th November, 1866 on the same matter. Kitty! eyes upon the wool! Not on me, my beautiful! On a thing that cannot see? If you must smile, smile this way! I will bear it as I may! Swift about the colored ball! ’Tis my heart you’re winding there? Kitty, I am in a vision! I shall catch and kiss them, dear! Tangled! pout not, frown not, Kitty! It may make me sin again. Tangling further heart and mind! I am holding up my heart? Wind and wind! I do not care! Smile or frown! and I will bear! Kiss, kiss, kiss them free again! ‘The Skein’ was published in the Broadway Magazine (No. 4, December 1867). It was reprinted in The New York Times, December 8th, 1867. No. III.—A Fashionable Love Affair. AND so we love our cousin James? Trust the old woman for a seer! Hath turn’d into a rosebud, dear! Not that it calls me names—it is not that! At sixty-five, how dull and stale and flat! That love will lift me up to God at last! When I was young—’tis fifty years ago. Gave me quick humours and eternal passions! A fearful part of my immortal soul. They put stone walls between us—it was just! His evil fiend behind him, and atone! Atone! atone! O the wild vows he swore! One moonless night, I cried, ‘I love no more! And I was withering in a bridal dress. What name they give to their unhallow’d thought! A street or two away. I sat by his bedside, and held his hand! And those wild eyes that rolled in fever’d pain! ‘My place is here—here, here,—by this bedside! Loved blindly on as mighty men aspire! And, Blanche, there came reward before the end. Scatter’d its dusky silver on his sleep. And, Blanche, just then he woke, and look’d at me! A wild, long look, bitter, without a breath! And thou art pale—so pale. Kiss me, and pardon the old woman’s tale. And here I am alive at sixty-two. I grieve still less, my dear, now I am older. Is pure for ever, in the world’s despite. ‘A Fashionable Love Affair’ was published in London Society (March, 1868). Had touched that perfumed clay. The clouds rain down such dew. Her motion was like a cloud’s. As if it blossom’d and blew. She could not read a page. As she pouted her lips and smiled. A flower in its leaves, she died. Is the sweeter for the flower. ‘A Drawing-Room Ballad’ was published in London Society (July, 1868). The last five verses were published in the 1874 King edition of the Poetical Works as ‘On A Young Poetess’s Grave’. Where the soul is dead. Is sadder than their grief. Nor foulness—it is so small! That do not stir at all! ‘The Faces’ was published in London Society (October, 1868). How dark and still the sky looks overhead! Walk quicker? Nelly Blair’s your name, you said? Have you been long in London? I hate it! hate the town, and all its ways! And I! An ugly place! all bad, all bad! Hardhearted as a flint, and dull and dark! But drink gets me in trouble always. Hark! That’s twelve o’clock. Let’s stop a minute, do! We can go home together by-and-by. This being out at night. ’Tis killing my ownself I fear to do! This night, and end it all. Ah, how you cough! You’d best go home to bed! Are you in pain? Rise up, and let us go! O Lord! O Lord! I wish that I was dead! Look how the air is whitening. It’s the Snow. How white it looks, how still! Lean on my arm a little. You are ill! Come on, come on. How white the streets are growing! I used to like the fields when it was snowing. 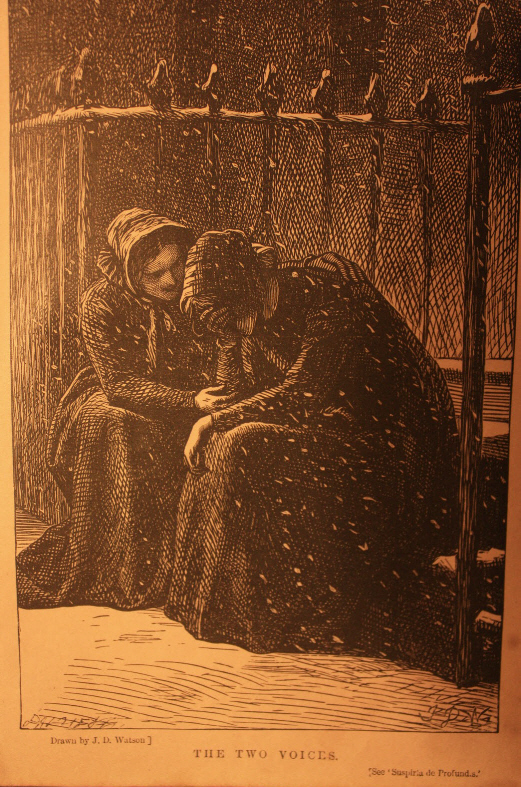 ‘Suspiria de Profundis’ was published in the Christmas edition of London Society (December, 1868). To her the poor folk came. Sweet words of peace she said. But the crust she gave was blest. The hamlets far and wide. And its gentle lady fled. Looked down with round bright eye. Was given to her again. And built it up once more. The day Dame Martha died. They bare her as she slept. And prayed, and blessed the dead. Out of Dame Martha’s well. Gleams up like water clear. First published (anonymously) in All The Year Round (13 November, 1869) and reprinted in Good Words (October, 1870) and the Glasgow Herald (4 October, 1870) ‘Dame Martha’s Well’ is a translation of a poem by the Danish writer, Bernhard Severin Ingemann (1789-1862). An earlier English version, ‘Dame Martha’s Fountain’, was published in the article, ‘Danish and Norwegian Literature’ in The Foreign Quarterly Review (Vol. VI No. XI, 1830 - p. 83) and was reprinted in Longfellow’s anthology, Poems of Places (1876). Buchanan mistakenly attributes the original to the Danish lyric poet, Christian Winther (1796-1876). My world grew stiller, colder—that was all. That flutters to the grass and makes no sound. Which sweeten’d that dull gloom wherein I dwelt. And saw in golden letters in the dark! Netted in sunny weather! May! May! May! And I was wearying in the dark again. And nothing but a shadow world remain’d. And nothing more, to me. But nought avail’d! Than seeing and the sunshine. Light, light,—a revelation; and I saw. With the unaccustom’d burthen of the sense. That I had fondled in my shadow-land. I shiver’d and felt cold. In the stale-smelling ball-room of the feast. Falling subdued and gentle. This my May! This golden-hair, the spirit of my dream! Nay, then, the world was bitter and a cheat! The light for changing thee! The face withdrew, and left me to my thoughts. And shadow-land had died into a dream. Ne’er had I felt so utterly alone! But now the light was solitude indeed. Men seek the shadow of the locust tree. What pictures come and fade before thy sight! To twilight and a silvery star of sound! 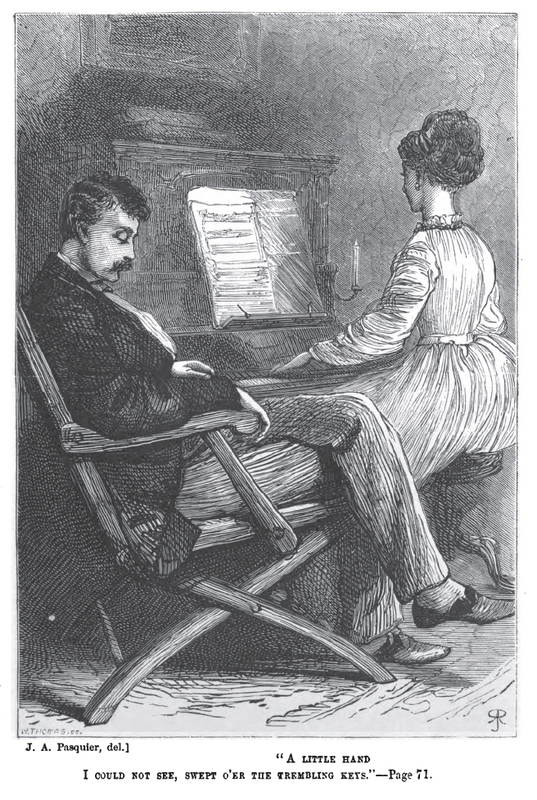 ‘A Blind Man’s Love’ was published in Routledge’s Christmas Annual (December, 1869). A ship sleeps, and the shadow of the ship. The fisher among his nets upon the shore! On the heights untravell’d, whither we are bound. O perishable brother, what a world! Streams liquid, like a living thing o’ the sea! And lifted thee, and moulded thee to shape! A Shade—which is a silence and a sleep! Its image on the flat stone in the sun. And falleth, falleth! Art thou comforted? And cry no more thou art companionless. ‘Earth’s Shadows’ was published in All The Year Round (8 January, 1870). A reworked version also appears in ‘The Man and the Shadow’, the second part of The Book of Orm.